Recent excavations carried out by Canadian archaeologist Patricia Sutherland may have further complimented our knowledge of Norse exploration into the New World. The excavations were carried out to establish the extent of Norse presence in the Americas and to further inform our knowledge of interactions between indigenous people and Norse explorers. National Geographic recently reported on the excavation – clearly the Norse presence in the Americas is a popular and fascinating subject and not just in the archaeological world. What does this new site say about Norse expansion across the North Atlantic? 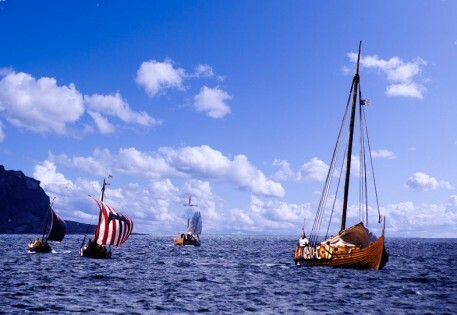 The popular perception is that the ‘Vikings’ were intrepid explorers bent on exploiting resources in foreign lands, though the evidence from Iceland and Greenland speaks more of land hungry settlers than marauding warriors. Is it possible that the Greenlandic seafarers who headed out to the New World were the last of the ‘true Vikings’ setting out on a risky voyage to discover new resources to exploit, or were they simply searching for new land to settle and farm? Was the motivation behind the expansion west more concerned with land settlement with an element of conformity; abundance of resources ripe for exploitation; or simply a hunger for exploration and a return to the older ‘Viking’ ways? Until recently, discussion relating to the early Norse settlement (Landnam) of Iceland, Greenland and America has been saga driven. A multi-disciplinary approach to archaeological research is revealing more about the motivation behind the Norse expansion west. By identifying the key elements of archaeological evidence relating to the initial settlement period from the 9th to the 11th centuries AD, such as settlement strategies, architecture, social stratification, subsistence economies and sustainability, the motivations behind the expansion may be revealed and may emphasize how decisive the initial choices were in their success. Clearly, a full discussion and comparison with the Tanfield Valley site is not currently possible as the report has not been published; therefore scant information is available with regards to any environmental evidence, context and plans. Archaeological and paleoecological evidence suggest a rapid, widespread development in both Greenland and Iceland (Vesteinsson 2002, 7) with a degree of experimentation in Iceland (Smith 1995, 331; Sigursson 2008, 572). Greenland was settled by Icelanders, perhaps driven by the pursuit of hunting for seal fur and walrus ivory (Arneborg 2008, 590), or the desire to attain power through land settlement (Dugmore et al 2007, 14; Hunt 2009, 390). The early settlers of Greenland had some contact with indigenous populations, such as the Thule Innuit and Dorset Paleo-Eskimos, mainly during hunting expeditions north for ivory. The Norse artefacts recovered from Arctic areas, such as a bronze vessel, smelted copper, whetstones, soapstone artefacts, can be explained by trade and exchange between the Norse and indigenous people (Gullov 2008; Sutherland 2008, 43) and may not be evident of any long-term settlement in the New World. Could the same motivations be behind the explorations and ‘settlement’ at Tanfield Valley? 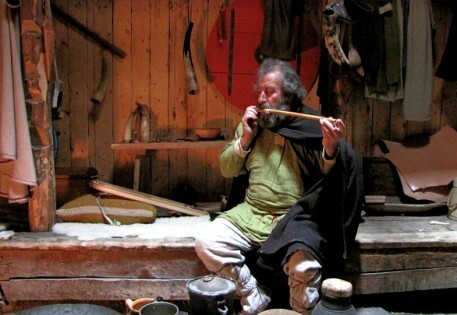 The explorers who ventured to L’Anse Aux Meadows and Tanfield Valley (Pringle 2012) built their dwellings in the same Norse long house style as the initial Greenlandic and Icelandic settlers (Seaver 2010, 25; Smith 1995, 328; Buckland 2008, 600; Arneborg 2008, 591-2; Wallace 2008, 607). A high degree of effort and labour were required to build such substantial structures that were built to last (Wallace 2009), perhaps evident of the strategic importance of the New World sites, or alternatively, the initial desire to settle these locations permanently. They were constructed using available materials such as rock for the foundations and turf for the roofs and walls; however large timber for the upright poles was in a shorter supply in Greenland and Iceland. Available wood would have been used for doors and as panelling for the interior walls and fittings (Seaver 2010, 25). The typical layout of a long-house included a hall with a central hearth and along either side there would be seating or beds (Seaver 2010, 26; Buckland 2008, 600; Arneborg 2008, 591-2). Farms had outbuildings such as pithouses, smithies, barns and byres (Smith 1995 328). There is no evidence of animal shelters in L’Anse Aux Meadows (Wallace 2009, 120; Wallace 2008, 607). Storage structures built from stone in Greenland are different to those in Iceland, which are turf and stone. In Greenland they are often placed in areas which would catch a strong wind to air dry meat (McGovern 1992, 211). Storage spaces at L’Anse Aux Meadows were relatively large (Wallace 2008, 608) perhaps for storing large quantities of preserved food to meet their needs as a replacement for fresh produce for the return journey to Greenland. The social structure of early Iceland centred on the relationship between land-owning farmers and chieftains (Smith 1995, 339). Social stratification can be seen in the diet, for instance the meat in the Greenlandic diet came primarily from seal (Arneborg 2008, 6); on the other hand, caribou meat may have been the reserve of the high status farms (McGovern 1992, 205). Animal bones from the Norse middens in Greenland suggest that there were differences in livestock in individual farms (Arneborg 2008, 6; McGovern 1992, 220) in that the higher-status farms had more cattle and the medium sized farms more sheep and goats and fewer cattle (Arneborg 2008, 592). In both countries, the richest farmland is occupied by the large estates and tight clusters of farmsteads controlled by the large farmstead (Vesteinsson 2002, 17). Garoar in Greenland has large halls, byres and barns and may have been a ‘control centre’ for the distribution of resources for the whole colony (McGovern 1992, 221). Elements of social stratification can also be seen in the difference in size of the buildings in L’Anse aux Meadows, with its hall for the chieftain/leader and smaller buildings to house the workforce (Wallace 2009, 120; Wallace 2008, 607). There is evidence of widespread charcoal production and local iron smelting in Myatvn region, Northern Iceland (McGovern 2006, 188) and specialised production in Hals, Western Iceland (Smith 1995, 334). Bog iron required smelting at high temperatures, consequently wood was needed in huge quantities. Environmental evidence of deforestation here supports this practice (Edvardsson 2003, 25; McGovern et al 2006, 189; Smith 1995, 336). Small scale iron working evidence has also been found at the L’Anse Aux Meadows site (Wallace 2009). Iron production was necessary to the early Icelandic economy, for ship repair and agricultural practices (Smith 1995, 335). Greenland does not have bog iron to exploit, thus iron must have been imported (Arneborg 2008, 590-3). The site at Tanfield Valley is close to a source of bog iron (Pringle 2012) which may have been utilized by the Norse or returned to Greenland in its raw state. Of course, this theory may be disproved if Iron working debris and tools are found at Tanfield Valley. The discovery of three walrus tusks at one of the initial settlement sites in Reykjavik suggests that early Icelandic settlers successfully hunted and processed walrus ivory (Pierce 2009, 59; Smith 1995, 329). Although there is no evidence of large-scale industry as there is in Greenland (Pierce 2009, 55; McGovern 2002) the evidence suggests that walrus hunting played a role in the colonization of both Greenland and Iceland (Harrison et al 2008, 100; Gullov 2008, 21; Arneborg 2008, 590-1). Evidence of tusk extraction appears in all sites across Greenland (McGovern 1992, 207; Harrison et al 2008, 100-12), which, along with furs, was the main trade of Greenland, in exchange for iron (Arneborg 2008, 590-3). Bones of the Arctic fox, which was the only indigenous land mammal in Iceland (Smith 1995, 323), are present in the Sveigakot assemblage. The animals appear to have been skinned and their pelts processed (McGovern 2006, 192; Harrison et al 2008, 111). It is probable that L’Anse Aux Meadows was a strategic winter-camp to collect timber, iron (Seaver 2010, 45), butternuts and wild grapes from further south – an area which may be the Vinland written about in the Sagas. These items may have been returned to Greenland when the season had finished. Artefacts recovered from sites in Greenland, Iceland, and North America are typically Norse, such as whetstones, ring headed pins, soapstone artefacts, bone combs, line sinkers and quern stones. Artefact types from early settlements and burials in Iceland are similar to Norse types and most were locally produced (Smith 1995, 329). 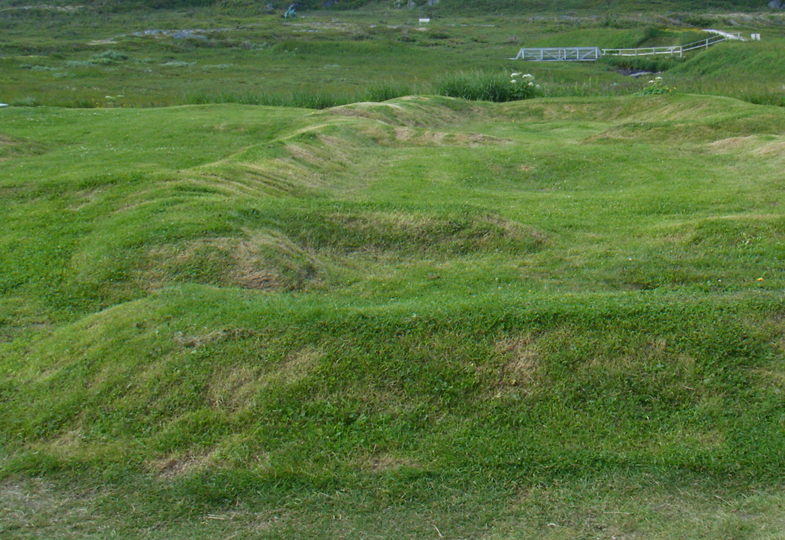 Artefacts from L’Anse Aux Meadows are typically Norse and related to specialised activities such as iron working, boat repair and textile work (Wallace 2009, 120). As reported by National Geographic the artefacts from the Tanfield Valley excavation include pieces of drilled whalebone, and from previous investigations spun hair from fur-bearing animals, all attributed to Norse material culture (Pringle 2012). The faunal and floral assemblages demonstrate that the Norse settlers of Iceland and Greenland exported a uniform North European based farming system supplemented by some cereal production and protein from a variety of wild resources (Amorosi et al 1992, 169; Sveinbjarnardottir et al 2008, 1; Buckland 2008, 598). There is no evidence of animal husbandry in L’Anse Aux Meadows; but they may have kept a small number of pigs (Wallace 2009, 120; Wallace 2008, 607), suggesting the site was never intended to be settled permanently or long-term. The early settlement subsistence economy of Greenland was very similar to Iceland, though Icelanders exploited a wider variety of wild resources, and Greenland depended more upon seals (McGovern 1992, 222; McGovern et al 2006 202; Vesteinsson et al 2002, 9) and caribou (Arneborg 2008, 590). The Icelandic domestic mammal bone assemblage includes cattle, sheep and goats, pigs and horses (McGovern & Perdikaris 2002, 5; Harrison et al 2008, 199; Sigursson 2008). In Greenland there are four main taxa present – cattle, caprines, seals and caribou. The mix of domestic mammals present is the same as Iceland, although, atypically, there are more goats than sheep in Greenland faunal assemblages (McGovern 1992, 195). In most Icelandic and Greelandic collections, there are high percentages of neonate cattle remains (McGovern & Perdikaris 2002, 7; Amorosi 1992, 124-5; Harrison et al 2008, 100; Arneborg 2008, 590). More emphasis was placed on cattle in both countries (Smith1995, 329; Vesteinsson et al 2002, 11), mainly for secondary products such as milk and cheese (Buckland 2008, 598; Arneborg 2008, 590). Faunal collections in early Iceland are dominated by the remains of sea birds in the north and ptarmigan in the south (McGovern et al 2006, 191 & 193-4). The remains of eggs from waterfowl, Ptarmigan and Guillemots are present in northern sites (McGovern & Perdikaris 2002, 2; McGovern et al 2006). The presence of marine fish bones inland indicate they were imported from coastal areas (McGovern & Perdikaris 2002, 10) as a preserved product, suggesting early production and exchange strategies and communication across Icelandic settlements (McGovern & Perdikaris 2002, 11; McGovern et al 2006, 195 & 203; Harrison et al 2008, 99). A similar scenario exists in Greenland with seal bones appearing at sites far inland (McGovern 1992, 205). Unlike the evidence from Iceland (Sigursson 2008, 572), fish remains are rare in early Greenlandic sites (Vesteinsson et al 2002, 10; McGovern 1992, 196). There is internal regional variability in both countries due to differing climate and resources (McGovern 1992, 196). For instance, the western settlement in Greenland was a more marginal environment for cattle herding, which is reflected in a higher percentage of seal and caribou remains present in the assemblage (McGovern 1992, 196). Perhaps it was the hardier inhabitants of the more marginal Western settlement who organised themselves to carry out repeated expeditions to the New World in search of more agreeable land, or for the purpose of exploiting the abundant resources of the New World (the sagas only speak of three voyages to the New World). The faunal assemblage at L’Anse Aux Meadows indicates that the Norse diet came mainly from marine sources (Wallace 2009). Should the Tanfield Valley site prove to be an outpost similar to L’Anse Aux Meadows, it may be assumed that the inhabitants shared a similar marine diet supplemented by preserved food. It is difficult to determine how much barley was grown in early Iceland or imported from overseas. The soil in Iceland was not ideal for crop growing. Barley found in dung on a Norse midden at Reynistadur is testament to the initial settlers bringing their traditional pastoral practices with them from the homeland. Greenlanders were not able to cultivate cereal at all (McGovern 1992, 222; Vesteinsson et al 2002, 9) and there is no evidence of cereal cultivation in L’Anse Aux Meadows (Wallace 2009, 120). The majority of the Barley seeds from Iceland were found in the animal dung, therefore relate to foddering practices (Trigg et al 2009, 68). Irrigation was necessary during the early Norse period to grow hay for animal fodder (Buckland et al 2008; Adderley & Simpson 2006). This practice can be seen in Scandinavia itself (Buckland et al 2008, 114), although irrigation was may have been used in Iceland to enhance production, whereas in Greenland, because of frequent summer droughts (Buckland et al 2008, 114) it seems that it was a critical land management practice (Adderley & Simpson 2006, 1676-7). It remains to be seen whether there is evidence of cultivation at the Tanfield Valley site. The aforementioned Norse settlement evidence reveals that a key reason for the expansion across the North Atlantic region was to set up productive agricultural settlements, therefore success depended on initial land management strategies (Adderley & Simpson 2006, 1666). The settlers of Greenland adopted similar strategies to the first Icelandic settlers of a century earlier, indicating that the chieftains were just as politically motivated and their primary concern was to fill their land with dependent farmers (Vestiensson 2002, 19), thereby retaining power. Nevertheless, the opportunity to exploit abundant wild resources found around Greenland and the Arctic, for trade, was also a powerful motivator, with L’Anse Aux Meadows and possibly Tanfield Valley acting as gateways to plentiful new resources. The evidence from Greenland suggests that although there was a reliance on imported domestic animals, the settlers adopted a flexible and diverse approach to their subsistence strategies and reciprocal trade networks in much the same way as in Iceland (Vesteinsson et al 2002, 9), and managed, initially, with a degree of success. The two known sites in the New World – L’Anse Aux Meadows and Tanfield Valley perhaps fit the profile of the image we have of Viking seafarers. The expeditions to these sites were fraught with danger from natural sources and also the known risk of conflict with the native inhabitants of these areas. The risk was deemed worthwhile but to what end? The initial motivation to conquer and settle the New World may be evident in the substantial buildings they erected, but not evident in the lack of visible subsistence practices and cultural deposits left behind. What is evident is that there was some successful contact with the indigenous population, but for how long and was this contact always peaceful? It is becoming more plausible that the two New World sites were highly important outposts used seasonally by a large group of entrepreneurial Greenlanders for the purpose of increasing their wealth by trading luxurious and exotic items. The anticipated publication of Sutherland’s findings may divulge more evidence to elucidate the motivation and organisation behind these voyages to the New World and how the Norse lived in the New World once they had arrived. Amorosi, T. 1992 Climate impact and human responses in NE Iceland: Archaeological investigations at Svalbaro 1986-1988 in Norse and Later Settlement and Subsistence in the North Atlantic (eds) Morris, C.D. & Rackham, J.D. Amorosi, T., Buckland, C., Olafsson, G, Sackler, J.P, Skidmore, P 1992. Site status and the paleoecological record: A discussion of the results from Bessastoir, Iceland in Norse and Later Settlement and Subsistence in the North Atlantic (eds) Morris, C.D. & Rackham, J.D. McGovern, T.H 1992 Bones, buildings and boundaries. Paleoeconomic approach to Norse Greenland in Norse and Later Settlement and Subsistence in the North Atlantic (eds) Morris, C.D. & Rackham, J.D. McGovern, T.H, Perdikaris, S. 2002 Preliminary Report of Animal Bones from Hrisheimur, Myvatn District, Northern Iceland. North Atlantic Biocultural Organisation (NABO) Research Cooperative. Available from www.nabo.com . Last accessed 28/11/11. Seaver, K. 2010 The Last Vikings: The Epic Story of the Great Norse Voyages London: I.B. Taurus & Co. Ltd.